When I planned this meal I knew the biggest part of the prep would be cooking the crepes, but after that it is a very simple and easy meal, even for a crowd. While I stood there flipping the crepes, I stirred the sauce and altogether had them cooked and assembled in about and hour and a half. This part can be done the night before or whenever it works. The crepes along with the sauce, can be refrigerated on the pan and reheated 20 minutes before eating. I served them with rice, stove top dressing, cranberry jelly and a cucumber/tomato salad. Easy accompaniments. This recipe makes 36 (7 inch) crepes and will serve 12 - 15. In large mixing bowl, beat eggs with hand held mixer. Add the rest of the ingredients, mixing until smooth. Preheat non-stick 7 inch pan just below medium heat. You may want to slightly butter after every third crepe or so. Holding pan up at a slight angle, pour a small ladle full (about 1-2 oz) of batter into pan, rotating to cover, then set back on element and cook until edges are firm enough to insert spatula to check if bottom is done. Flip and cook other side. Stack cooked crepes on plate. In medium saucepan, over low heat, melt butter, then stir in the flour. Using whisk, stir in milk just gradually enough to first get a smooth paste and then slowly adding the rest of the milk. Stir frequently until bubbly. (I did this while cooking the crepes.) Add cheese and bouillon while cooking. Mix 3 - 3 1//2 cups sauce into shredded chicken, reserving the rest for the top. Place about 2 - 3 Tbsp of filling into each crepe, roll up and place side by side in Pyrex pans or cookie sheets. Plan so you can fit all in the oven at the same time. Drizzle with leftover sauce and refrigerate until ready to cook in the oven at 350 F for about 20 - 25 minutes, covered loosely with foil. This is such a great idea to serve the family when they all come for brunch. Thanks for the idea. I'm sorry I missed this Pastorate meal. That looks so very delicious !! Thank you for sharing. Wondering how these would freeze and to make the sauce when the crepes are ready to be used . Anyone have an idea ? Thank you . 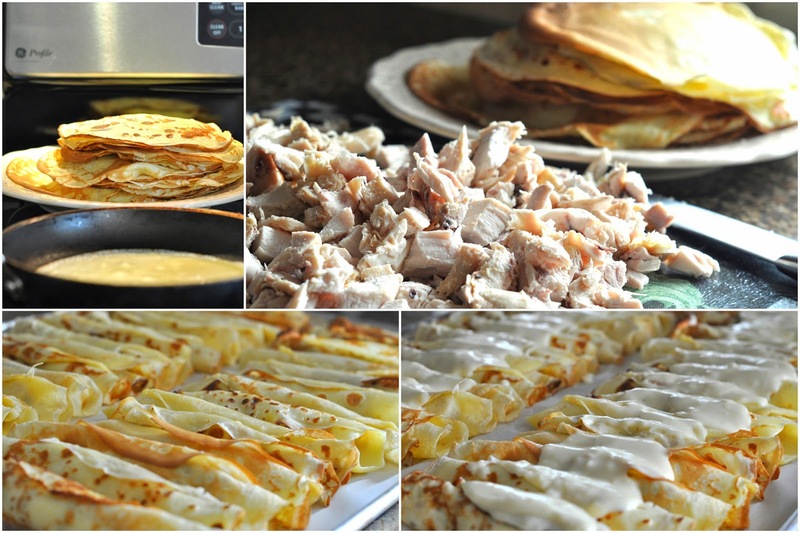 I can't say that I have ever frozen crepes, but I have used chopped, frozen chicken to speed up the process. I have also made them ahead and refrigerated them to re-heat. Having said that, I think it should be okay to freeze them.. the only thing that could happen is that the texture could change (soften them). I would suggest trying a smalll recipe first before serving a large group.